An absurdly good breakfast with Gabe at the Mission Beach Cafe on Sunday morning got me thinking about the art of brunch, by which I mean a mid-morning (or early-afternoon) meal where everything flows, from the conversation to the artisan coffee, to the fresh pomegranate-orange juices. Impeccably executed and presented food is set before you in an unpretentious, relaxed setting, allowing you to languorously eat, drink and converse. These fluffy pancakes, made with creamy, calcium-rich yogurt and nutty Omega-3-laden flax seed are topped with fresh strawberries (though feel free to switch it up with whatever the seasons present). The next time I serve brunch at Chez Gabi, these guys will definitely be making an appearance. 1/2 cup plain low-fat yogurt $1 for 8 oz. 3 tbsp ground flax seed $2.50 for 16 oz. Whisk egg, milk, yogurt and oil together in a mixing bowl. Whisk in flour, flax seed, salt and sugar. Continue whisking until batter is smooth and creamy. Heat 1 tbsp oil in a large frying pan over medium-high heat. Once oil and pan are very hot, spoon batter in 1/8 cup increments, with space between them, into the pan, working in batches. 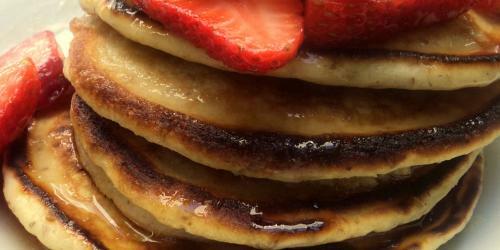 Cook pancakes on one side until the edges are dry and the bottoms are golden-brown. Flip, using a spatula and cook on the other side. Serve hot, topped with strawberries. Serve with butter and syrup if desired. Thanks, these were great. I found them on a random google search for pancakes with flax seed. I love that the yogurt makes them moist enough that you can skip syrup if you want in favor of just the strawberries or other fruit. I used 1/2 whole wheat pastry flour but otherwise followed the recipe exactly.